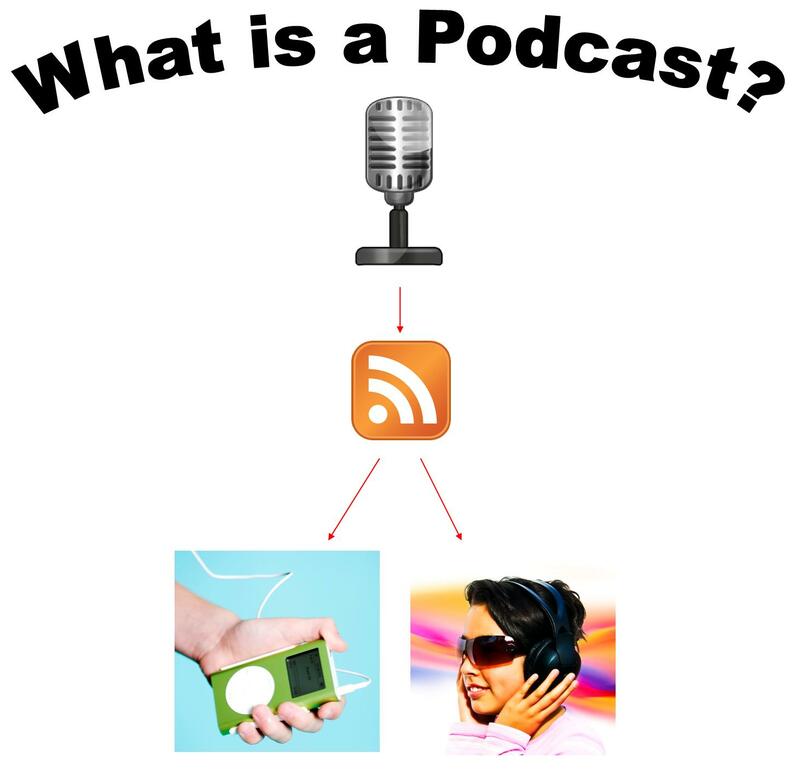 In the simplest terms, a podcast is a radio show (it can also be a video show) that is distributed via the Internet. Podcasts have also been referred to as internet radio shows, netcasts, online radio shows, and a variety of other labels, but the generally accepted term is “podcast”. The word “podcast” was coined by a meshing of the words “iPod” and “broadcast” since at the time, the iPod was the most common means of consuming podcasts. Let me clarify though, an iPod is NOT required to enjoy podcasts. Podcasting started out as, and most often still is, a show created specifically for the Internet although many major radio shows from terrestrial radio have begun to release their shows in podcast form as well. One of the most important differentiating factors between a podcast and a terrestrial radio show is the fact that you don’t have to “tune in” to the show at a specific time when the show is “on the air”. Podcasts are available to listen to when you want, where you want, and as many times as you want; they are what we call “on demand” content. You can listen to podcasts on your portable media player, on your computer, on your smartphone, and more recently, right from your car stereo. Another difference is that the shows are not confined to a specific time frame. A show can be as short or as long as the podcast producer chooses. I’ve found that the typical length of a podcast episode ranges from 30 to 60 minutes. If the simple definition is not good enough for you let me try to break it down a little more. The means of distribution for a podcast is a technology called RSS, which stands for Really Simple Syndication. RSS gives listeners to a particular podcast the ability to “subscribe” to that show so that they are notified the moment a new episode is released. Listeners can subscribe to podcasts by email, an RSS feed reader, or through a podcast directory like iTunes. Each podcast has a unique RSS feed address that delivers each episode to everyone who has subscribed to it. Fellow podcast consultant, Dave Jackson, uses an analogy which compares the podcast’s unique feed address to the frequency on a radio dial. For example, if your favorite radio station is at 90.3 on the FM dial, you must tune your radio to that frequency in order to listen to that station. When tuned to 90.3, you’ll only be hearing content from that radio station. The same is true for a podcast’s RSS feed address. When you subscribe to that RSS feed the only content that will be delivered via that feed is content from that show’s producer. What Kind of Podcasts Are Out There? Podcast content is greatly varied. There are talk shows, music shows, audio dramas, educational/instructional shows, and much more. Generally speaking, the most common show format is the talk show. These are similar to terrestrial radio in that they feature segments with news, interviews, and monologues on a given topic. No matter what your hobbies or interests are, chances are that there is a podcast on that subject. The following is a listing of a few shows that I know of that demonstrates the diverse range of topics covered by podcasters. So How Do I Subscribe? One great thing about podcasts is that you can subscribe to as many as you want. I personally subscribe to nearly 100 different shows. As I mentioned previously, there are several ways you can subscribe to podcasts. Some of the most common ways are via iTunes, a smartphone app, or an RSS feed reader (also called a feed aggregator). Subscribing in iTunes fairly simple since most podcasters have a link on their website directly to their page in iTunes. From there it’s just a matter of clicking the “subscribe” button. If you prefer to use an RSS feed reader, I recommend Google Reader which allows you to subscribe to any RSS feed, even ones that are not yet listed in iTunes. Simply click the “Add A Subscription” button and paste the RSS feed address for the podcast there. Some podcast websites even allow you to automatically open their RSS feed directly in Google Reader. You can then sort them into categories that you want and listen to all your podcast in one place without having to visit each show’s website every time a new episode is released. You can also subscribe to podcasts via your smartphone if you’d rather listen to them on the go. There are many different applications that will allow you to do this, but I will highlight just a few of them. First, there is an app for both iOS (Apple’s mobile operating system) and Android called Pocket Casts. This is a really nicely designed application that also has a search feature which allows you to find new shows. For Android users, Google has developed an app called Google Listen which works very well too. The benefit of this app is that it will sync with your Google Reader subscriptions so you can subscribe on your computer and the podcast will appear on your phone as well. Apple also has developed an application for their iOS devices called Podcasts which offers similar features. Pocket Casts is a feature rich app that is for sale in the marketplaces for both Android and iOS devices. Both Google Listen and Apple’s Podcasts apps are free in their respective marketplaces. Hopefully this has provided a bit of information about the world of podcasts. If you have any questions or need further clarification on anything I’ve mentioned please leave me a comment below this post. You may also want to check out a similar (and a little more technically detailed) article titled What’s A Podcast by Dr. Thomas Lamar on his podcast website. His show is called Spinal Column Radio and is all about the chiropractic profession. If you’re interested in getting help with starting your own podcast you can visit www.learnhowtopodcast.com for free tutorials by Cliff Ravenscraft. If you still need help, feel free to contact me for consulting. And if you’d like to learn about the shows that I produce, visit www.radiocss.com.